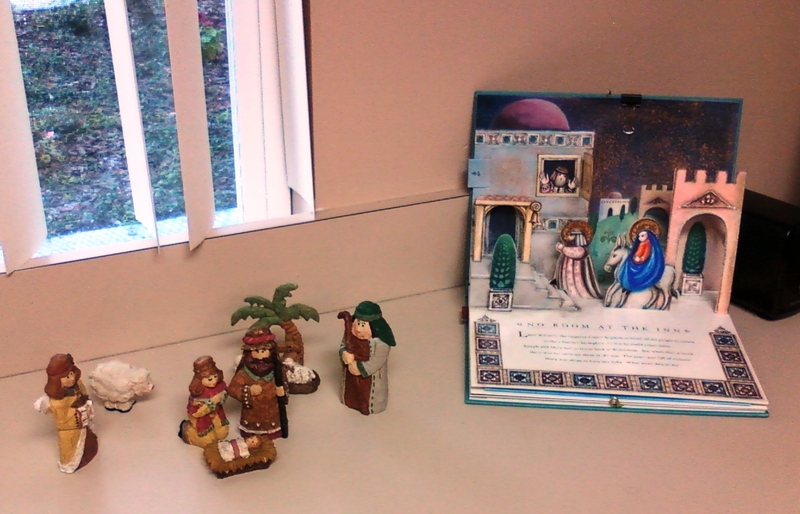 I’m not sure just how long ago I started collecting Nativity scenes. I know it was after I was grown, after my kids were born and we started going to St. Paul Lutheran Church, where both of my children were baptized and later confirmed. I think the first one was the Mexican tin one, but I’m just not sure. Some I found at garage or estate sales. Some were given to me. Some I found at after-Christmas sales. I haven’t had them out on display for years. Since the kids are grown, I no longer attend church, and no one in my house but me has any kind of emotional connection or memory with them, they’ve just stayed in their boxes, surviving the gypsy times, and waiting for a chance to be seen and once again appreciated. When my work sent out an e-mail about a decorating contest, I looked through the bins in the garage and rediscovered my collection. I thought I’d just choose one or two, but I ended up putting them all up around my office. My friends at work really seemed to enjoy them and it was nice to be able to share them and revisit each one myself.